Earlier this year in March I was privileged enough to have the opportunity to travel to Japan as participant in the Japanese Government's JENESYS 2.0 Programme. The acronym JENESYS stands for Japan-East Asia Network of Exchange for Students and Youths, with JENESYS 2.0 being the second stage of the project. The project is a youth exchange programme promoting 'Cool Japan' to 'revitalise the Japanese economy' through the introduction of Japan's attractions to foreign tourists to promote 'international understanding'. The programme I was invited on consisted of a group of around 250 youths from countries such as Indonesia, Malaysia, the Philippines, Singapore, Thailand, Brunei, Vietnam, Cambodia, Laos, Myanmar, East Timor and New Zealand. We embarked on a whirlwind 10 day trip to Japan, taking part in sightseeing trips for a few days before dividing into international subgroups of around 40 to travel to an allocated area of regional Japan - Kagoshima, Yamagata, Chiba, Shizuoka, Kochi, Fukushima, Shimane, Nagano and Ibaraki. In these regional areas we got the chance to experience authentic cultural experience and interact with the locals, and some of us were lucky enough to go on home or farm stays for a night with a host family. 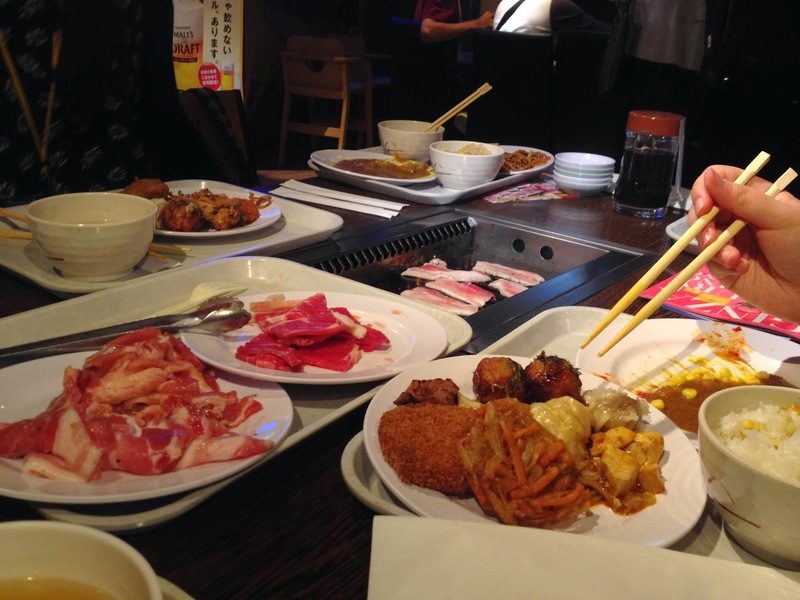 Among all the beautiful sights of Japan and its lesser known regional cities, the trip was not only a culturally gratifying and unforgettable experience but we also got to open our mouths and tummies to the traditional, famous and some of the lesser known delicacies of Japan. Let's start with dessert first. Specifically, ice cream. Available from a vending machine. 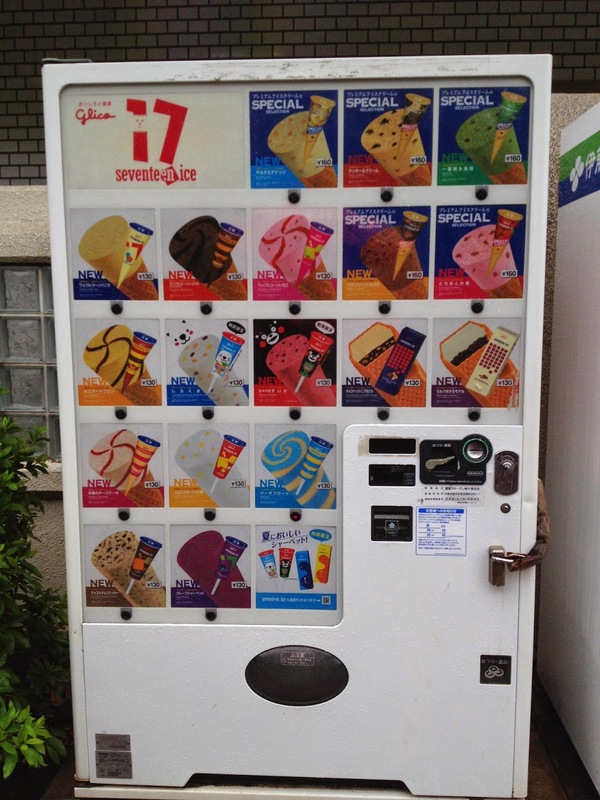 Yes, if you've been to Japan before you would have seen these special vending machines nestled on the side of the footpath, in parks or near temples, dedicated solely to ice cream. It's a wonder how they stay so cold when it might be 30 degrees plus outside, but they do thanks to advanced Japanese technology. The flavours are much different to those in Australia - think strawberry and matcha flavoured cornetto-style cones, psychedelic swirls in bright playful colours and ice cream sandwiched inside crunchy kiddy-style rectangular cones. Most sell different varieties of ice creams, so each time you might be surprised. There were two vending machines in the lobby of our hotel, the Hotel New Otani Makuhari on the outskirts of Tokyo. One sold snack and meals (cup noodles or packet waffles, anyone?) and the other was for dessert! The first night, exhausted from the 9 hour flight from Sydney at an hour I'm sure was far too late for dessert, I went down to treat myself to dessert. 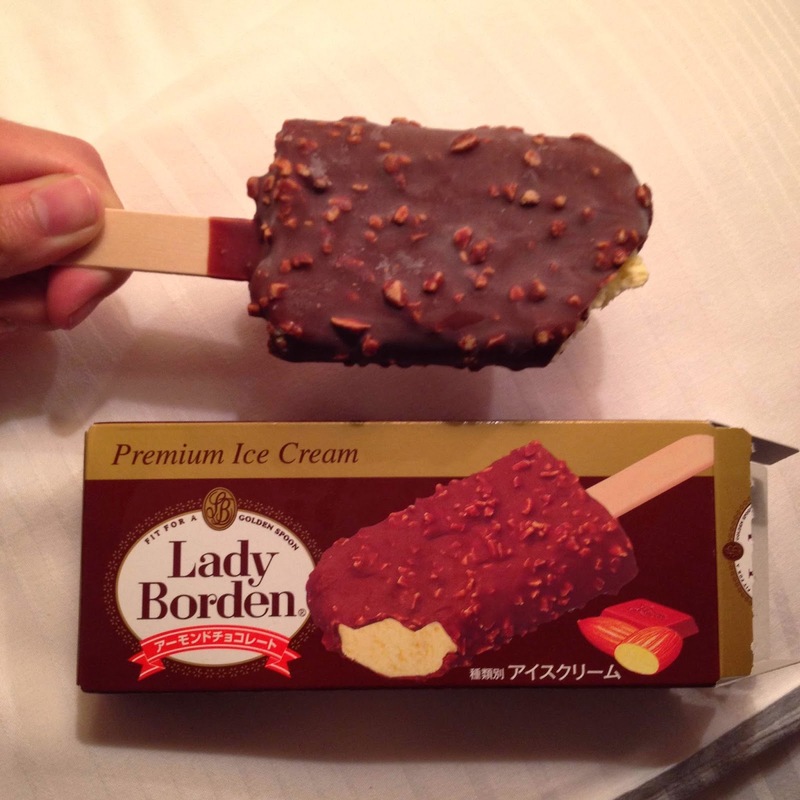 As well as this Lady Borden ice cream, it also sold cute Haagen Dazs ice cream cups and ice cream sandwiches and cute chocolate coated ice cream drops. This particular ice cream was vanilla flavoured, coated in chocolate and almonds much like an almond Magnum. The ice cream inside was much more yellow than normal vanilla ice cream, probably due to the different variety of milk used, but it tasted so good. 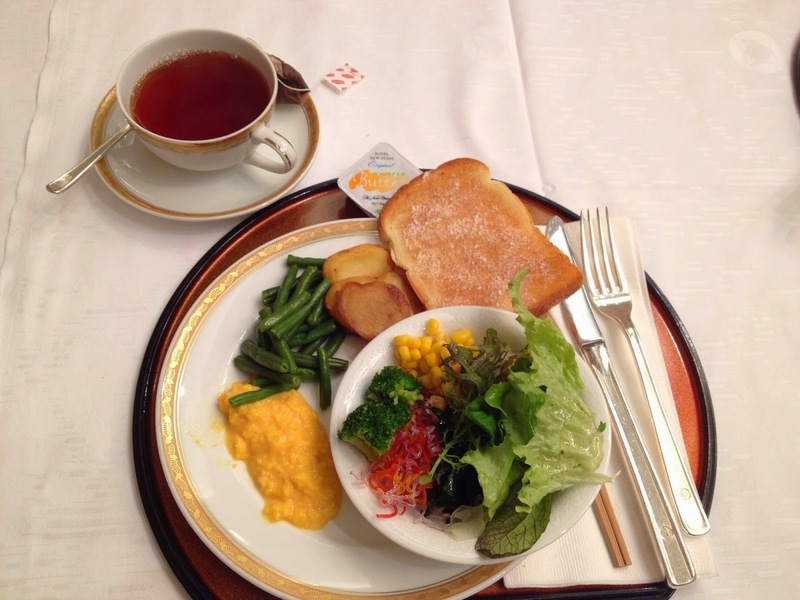 Buffet breakfasts were the way we began every day at the hotel, with dishes that included scrambled eggs, omelets, bacon, vegetables, various breads and pastries, a DIY Japanese salad bar, fruit and yoghurt and even corn flakes! From day to day there were a few swaps here and there, but I have to admit that by the end I was quite sick of buffets. 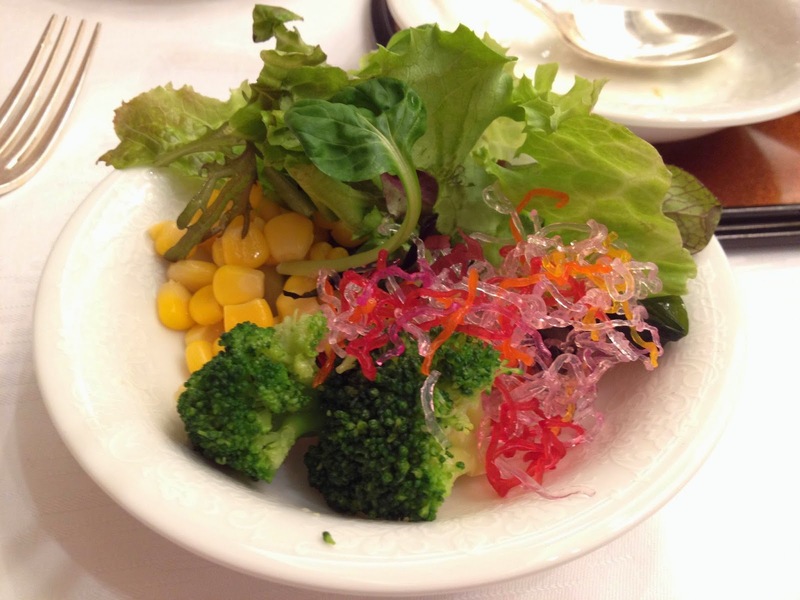 The salad bar included the mandatory salad leaves and additions such as cucumber, onion and corn, but other interesting additions included seaweed (wakame), radish and this colourful and chewy squiggly food that was labelled 'seaweed'. How interesting! The bread section tickled my fancy. 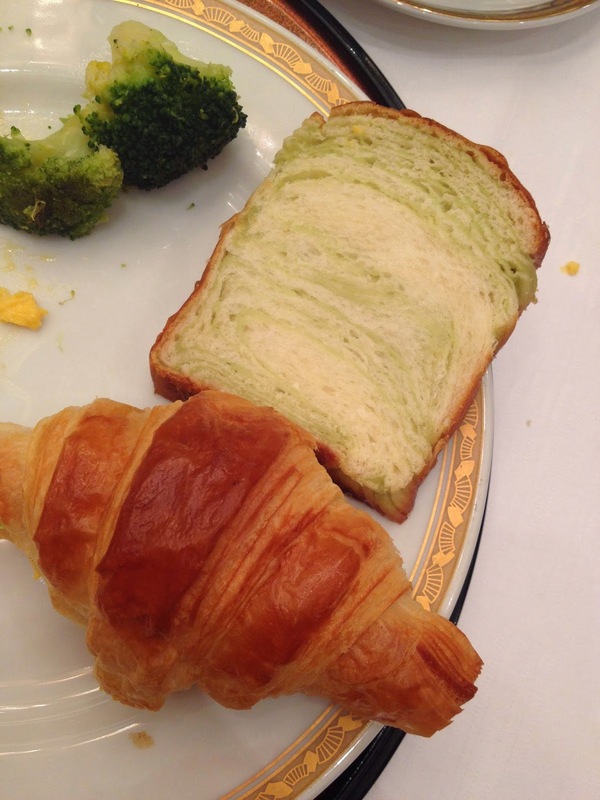 As well as toast (sadly not the thick-cut kind that I love in Japan), croissants and danishes there were milk buns, red bean buns and the ubiquitous melon pan - a green marbled, real melon flavoured sweet bread. I'm not kidding, it tasted so much like melon!! 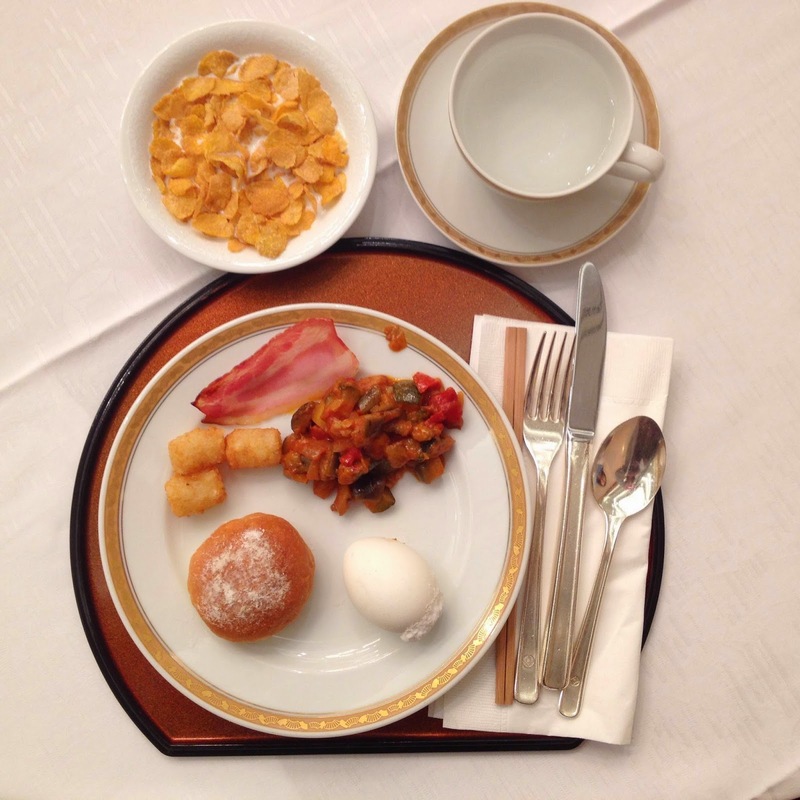 One morning I was overjoyed to find ratatouille among the offerings as well as tater tots! 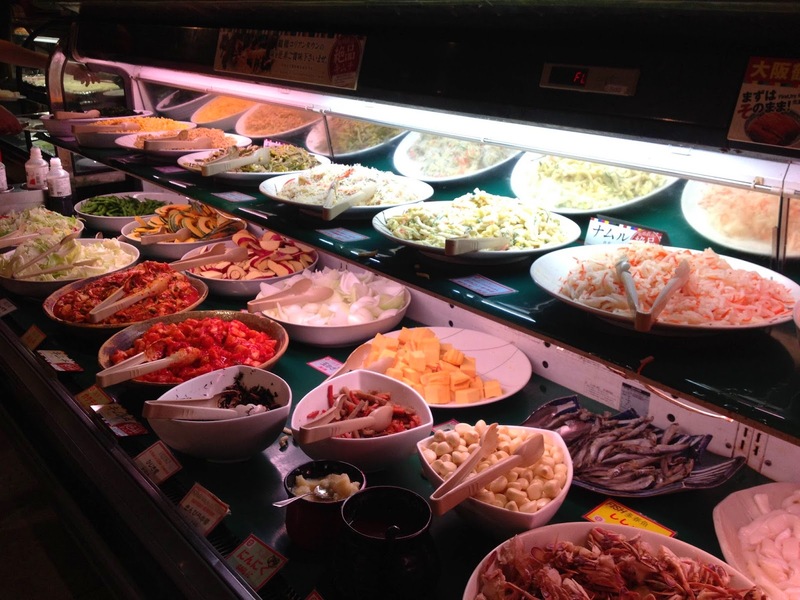 What would a visit to Japan be without an obento? 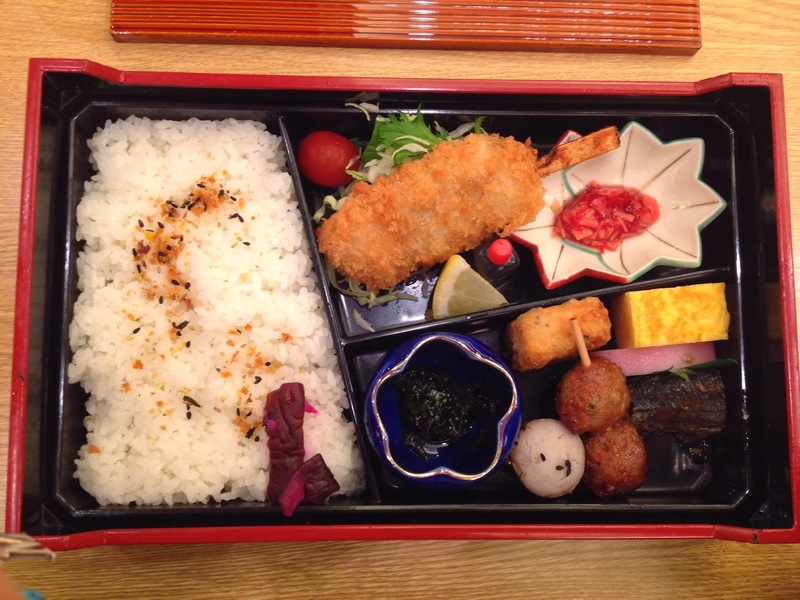 This obento was what we received on our first full day of the programme during orientation. It came packed in a beautiful engraved plastic box that opened to reveal a sight that made the mouth drool. One side was packed with perfectly cooked short grain rice sprinkled with sesame and golden crunchy flakes. The other had an artful array of bits and pieces (clockwise from top left): chicken katsu with sauce in a separate bottle, tomato flavoured dried scallops, tamago (egg omelet), a piece of salted fish, pork balls, fish cake, steamed taro and an unami mix of little white dots and seaweed. Oishii (delicious)!!! This is why I live for Japanese food. 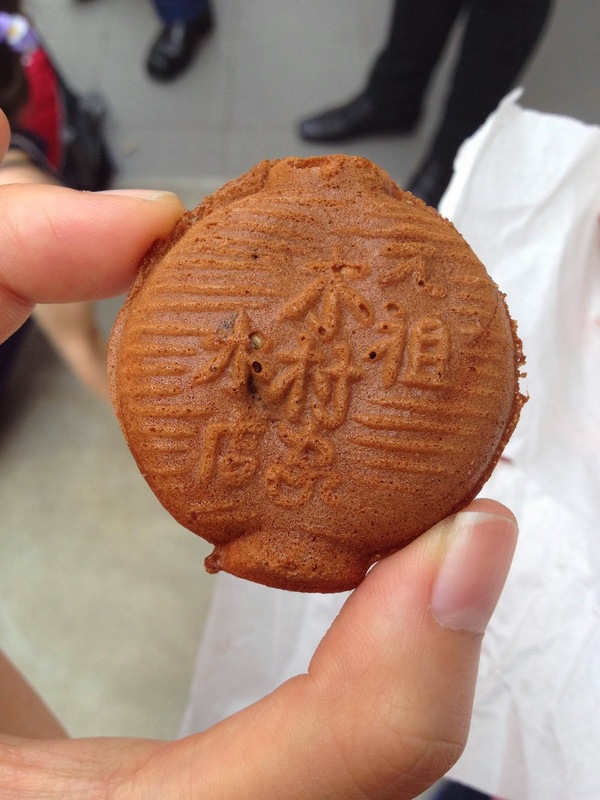 Ningyo-yaki is a traditional Japanese street-side sweet snack made from a batter cooked in specially moulded casts filled with red bean (anko) paste. 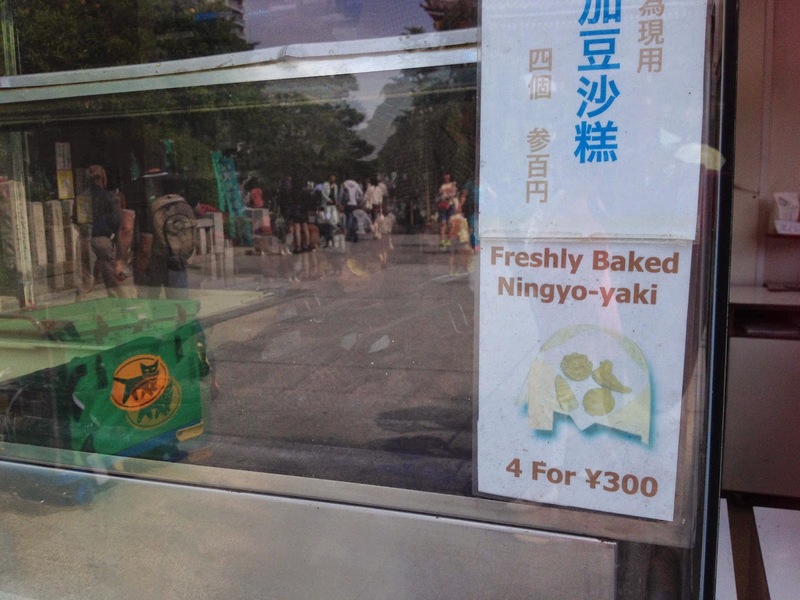 In Japanese, the name Ningyo-yaki literally translates to 'fried dolls' , which seems fitting for such a cute food. Upon visitng Senso-ji in Asakusa, walking along Nakamise-dori, we were given time to wander around the souvenir shops and I stumbled upon this stall and was mesmerised by the men cooking these over hot coals. They were so cute, with one of the shapes replicating the huge lantern that hangs inside the temple (Asakusa Kaminarimon) and another of the temples gates (chochin). I love red bean, and these tiny, mini waffle-like cakes were the perfect traditional Japanese treat. 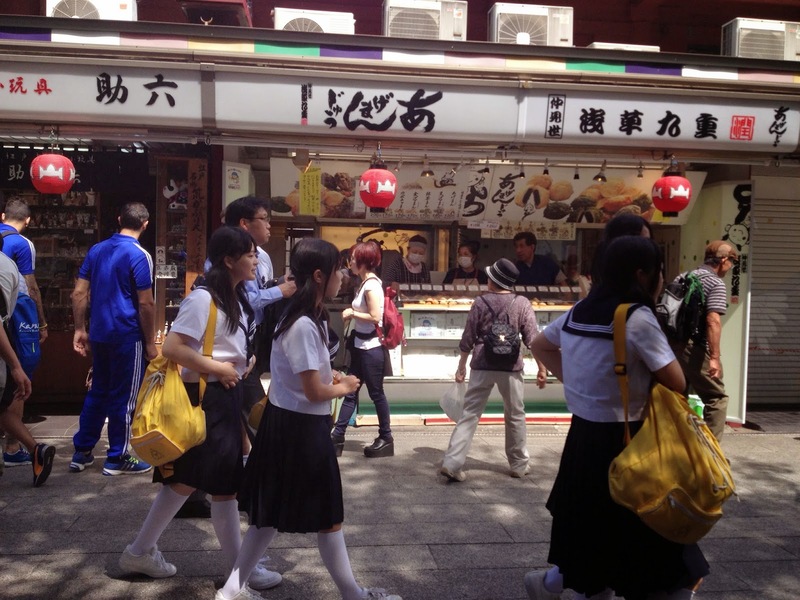 These donuts were also bought just outside the temple, called Agemanju. 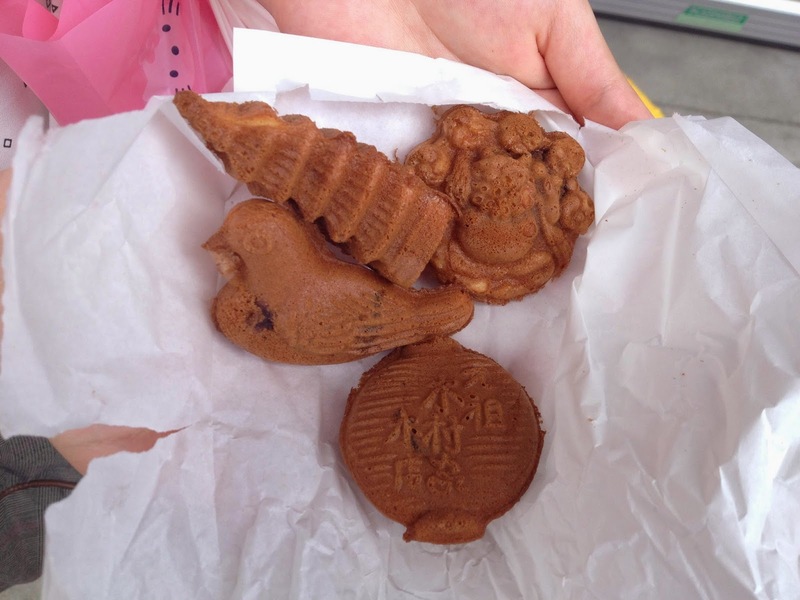 They were 100-150 yen each, with flavours ranging from green tea to red bean to sweet potato. Sold individually and run by locals, these were worth coming specially to Asakusa for, deep fried balls of goodness (for more about them see my post here). 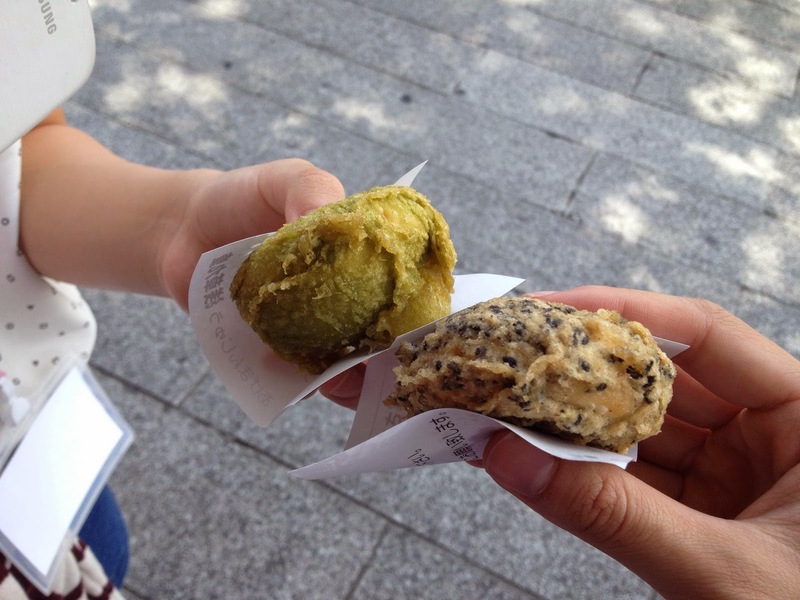 These were green tea (left) and black sesame flavoured (right, with a red bean filling). Yummmm. 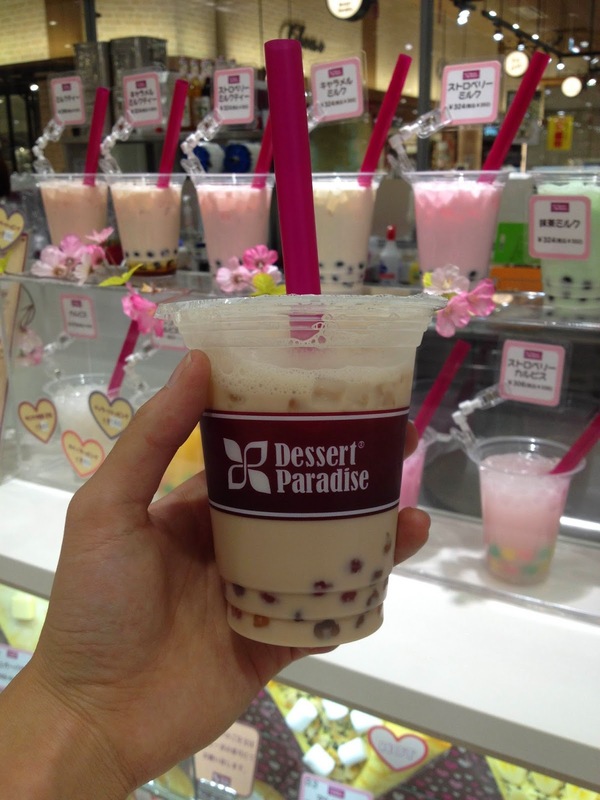 Bubble tea is a must Japan, just to try the authentic Japanese bubble tea. This cup was 300 yen (approximately $3), bought from Aeon shopping mall in Makuhari hear our hotel, which was a mammoth of a shopping mall made up of 4 interconnecting mini-malls - 'grand' mall, 'pet' mall, 'family' mall and 'active' mall. We spent more than a couple of nights here just wandering around. The shops were very boutiquey and uniquely Japanese, with one of my favourites, UNIQLO. But more about that later. There are so many flavour available - from matcha, coconut, milk tea, to mixtures of flavours that included the Japanese drink, Calpis with an assortment of bubbles and jellies. A match made in heaven. Ohhhh and the bakeries!! 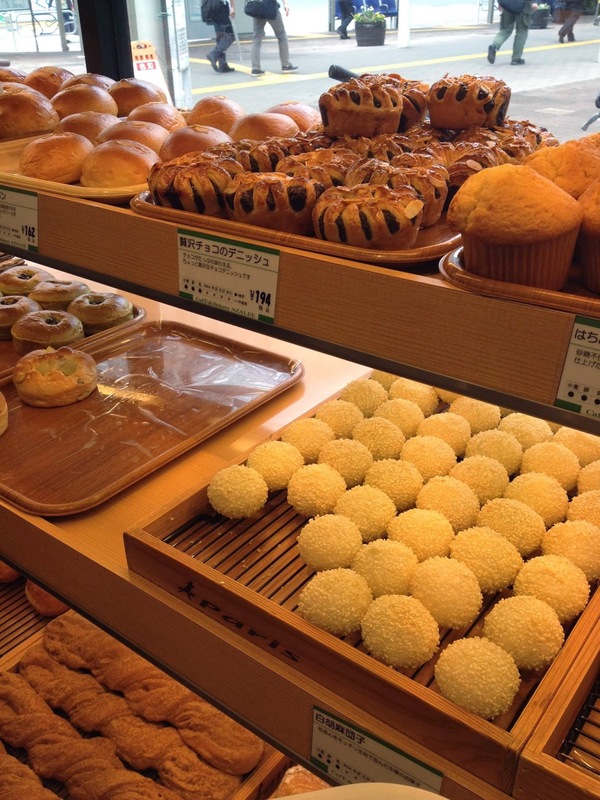 As if I wasn't already mesmerised by Asian bakeries in Australia, the bakeries in Japan are another type of store altogether. There were so many different bread and confections I wanted to try, but from Azalee Bakery near Funabori Town Hall. 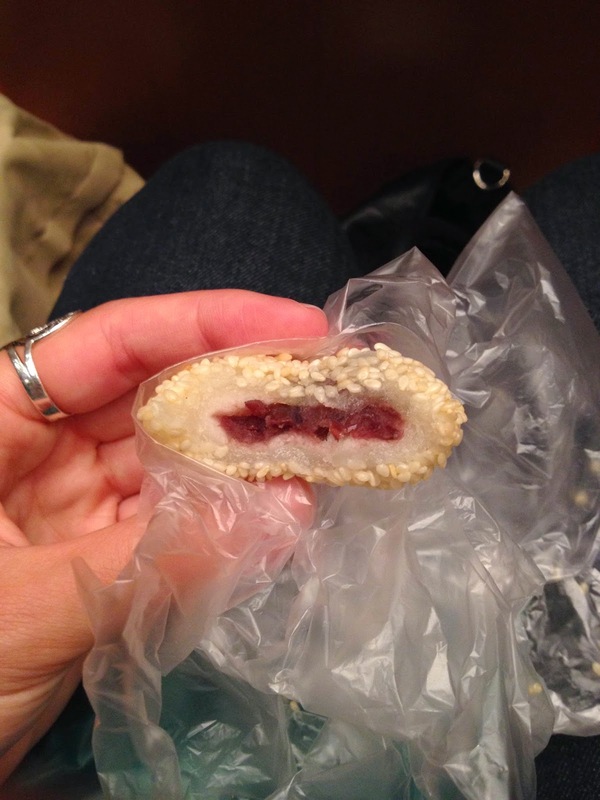 This was a form a mochi rolled in sesame and filled with red bean. Like a healthy, non-fried, Japanese version of Jin Deui (my fave Asian sweet snack!). Dinners on the programme were absolute food heaven (well, most of them anyway). 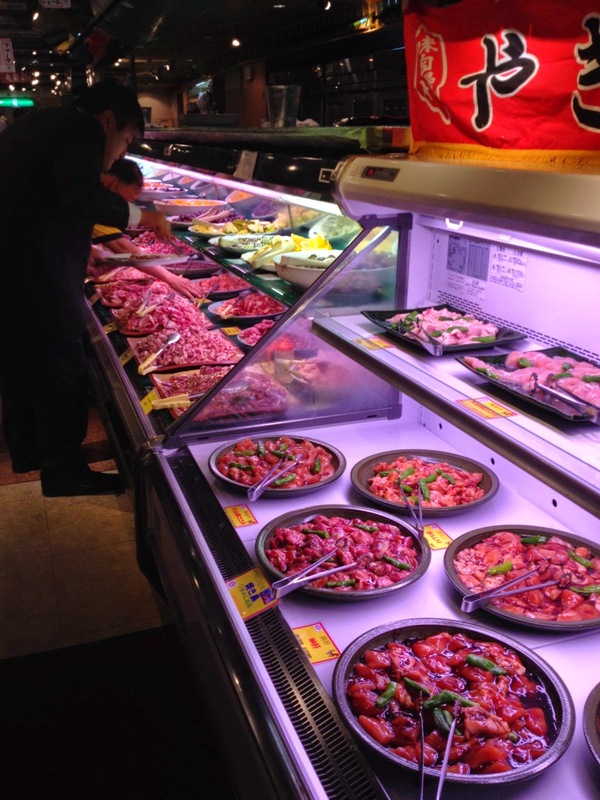 A lot of the time we were taken to restaurants that buffets because of the wide dietary requirements of such a large group, and the best one was at a place called Carne Station in Ginza. This was a buffet, BBQ meat restaurant where we were able to help ourselves to a spread of hot food and raw meats, which we took back to our tables to grill on a hot plate as we wanted to. The raw meat and seafood were plentiful - marinated chicken, wafer-thin strips of fatty beef and pork, crab legs, mussels, fish, calamari and squid, octopus, as well as sliced sweet potato, cabbage, pumpkin and onion. 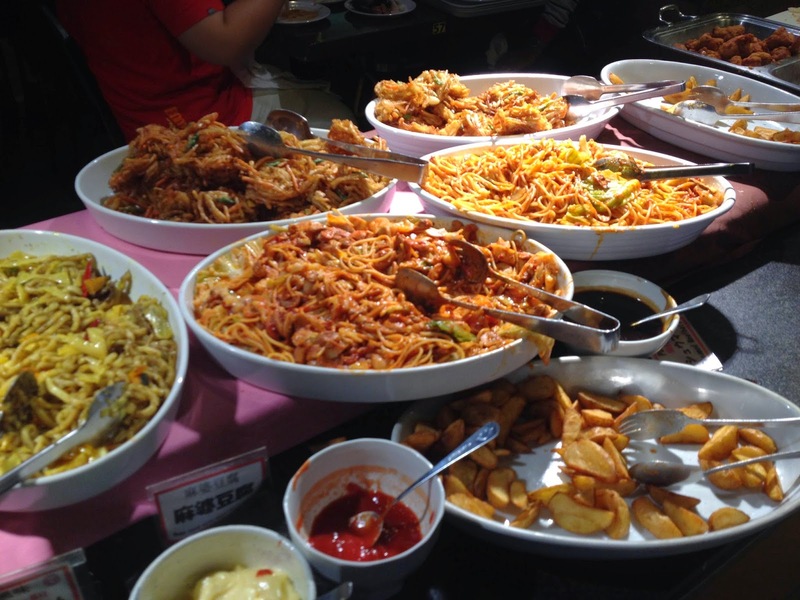 Aside from the meat and hot buffet was a huge range of salad options - vermicelli, seaweed, potato and past salad, tofu, beansprouts, noodle salads.... AND a separate cake cabinet full of vanilla, strawberry and matcha cheesecake, an ice cream station and jelly and fruit. And finally a more traditional Japanese dinner. This was on our first night, at a restaurant called Hana No Mai in Chiba, a traditional restaurant with screen walls and tatami mats with drop-down floors. We were all so overcome with joy and exhaustion that we dove in to this stunning meal - a cold shredded chicken-style main mixed with mayonnaise and wholegrain mustard, a scoop of potato salad, some green salad, rice, fresh tuna sashimi, a bamboo and bean side dish and nourishing clear soup. 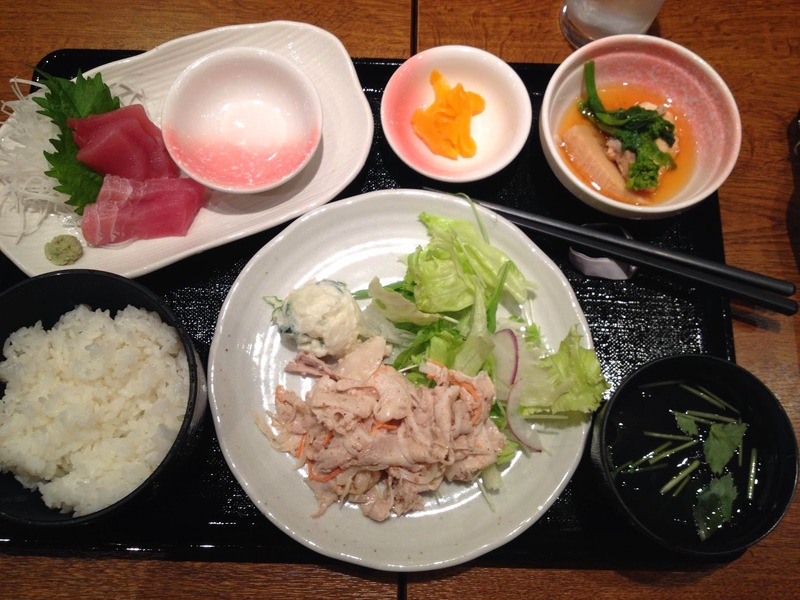 Clean and wholesome, the perfect example of Japanese food. What an incredible opportunity. Bet you had a blast!